It dawns on me that, some time ago, I started chatting about BFG ships! Behold! My glorious IIIrd Legion fleet in all its glory! This is my complete (for now...) fleet. As you can tell, I quite like this fleet! It comes together nicely, has a good range of ships, and feels mixed and exciting. There are a few, fluff wise, older designs to fit with the heresy era, as well as several of the armoured prow sporting ships that, although initially post-heresy designs, have now been re-conned into the heresy era canon. I hope the few BFG posts I managed to pump out last year have given you some inspiration for BFG. It is a game we both really enjoy and which has stood the test of time. You never know, it might even get a re-boot! 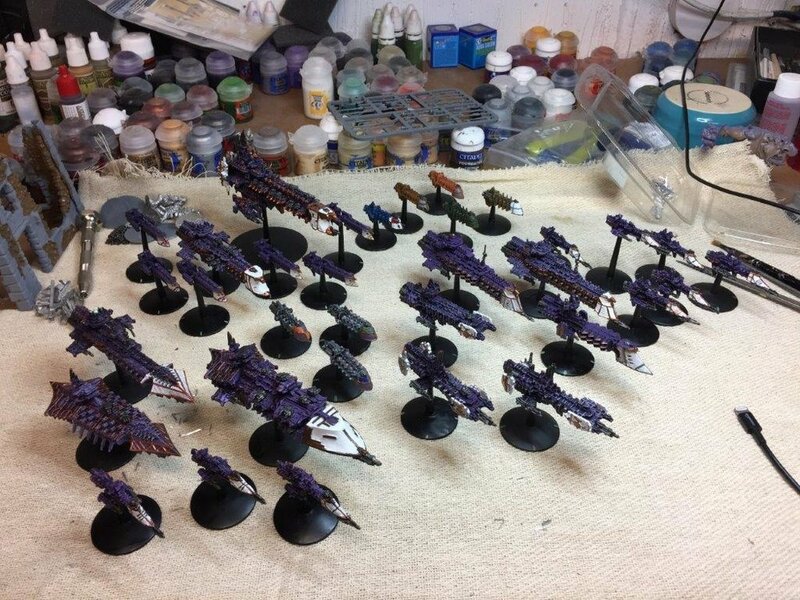 Stay tuned over the next few months to see my Eldar fleet progress, my Alpha Legion fleet appear, and to see more of Brother Handro's Imperial fleet close up!